As a financial advisor, you know that you would be nothing without your clients. Today’s most successful advisors spend a good amount of time focusing on client experience, which is something that can bring a lot of benefits to their work. And, as an advisor, boosting your clients’ experience has never been easier. Today, financial technology has remodeled client experience in the financial services industry. Let’s be honest, the work done in the financial industry is not the most exciting to clients. And while what you or your firm is doing may be getting you buy, there is so much more that you could be utilizing to separate yourself from other advisors in the area. Take a moment to think about the services you provide to your clients and the overall experience they get from said services. Once you’ve recognized there is room to improve your client’s experience, try the following methods to help elevate the experience your clientele receives. So many things are done online these days. It seems that people are now relying on the internet to find their advisors, rather than a referral or other traditional method. Whether you are an independent financial advisor or work for a firm, your digital presence should reflect what consumers are looking for. Establishing credibility online is crucial and your website plays an important role. Clients and prospects will first look to websites to gain a better understanding of a firm or an independent advisor, the services offered, and how they may be beneficial. And, be sure that the website is compatible with mobile devices, as most searches will be done on them. In addition to a website, advisors should have a social media presence to connect with prospects and clients. You can expand your outreach by having a robust presence on social platforms like Facebook, Twitter, LinkedIn, and Instagram. Being on social media allows you to interact with clients, create and share relevant content, and more. Once you start bringing in clients it is important to make a great first impression, and the onboarding process is a terrific opportunity to do so. Gone are the days of meeting clients with stacks of forms, endless fact-finding questions, and an overload of paper statements. Don’t waste valuable face time and bore your clients with this outdated method. Instead, keep the onboarding process online so that clients can enter their personal information on their own time. This will make the onboarding process less tedious and allow you to have more time getting to know your clients and address other business needs. If you or your firm uses technology that entrusts clients to plan their financial futures through an interactive experience, you are already setting yourself apart from the competition. This technology allows clients to feel invested in the financial planning process and encourages collaboration between the client and advisor, whether it’s collecting data, building online plans, or discussing goals. Expanding your planning process will put clients at ease knowing that their plans will be updated automatically and that they can see their progress towards making financial goals a reality. Great financial advisors would agree that communication is key in the financial planning process. Today, client communication is centered around being proactive and going above and beyond your client’s expectations. Is your client expecting a child in the near future? Send them valuable resources related to budgeting for newborns, and set up a call or in=person meeting to go over budgeting, answering any questions that you can. As an advisor it is your responsibility to show that you care, keeping them up-to-date with their financial plans. As a safety net, you can always ask clients the methods of communication they prefer, and how often they prefer it. By making clients feel like they are important and a high priority using compelling communication will leave them more satisfied and likely to give more referrals. 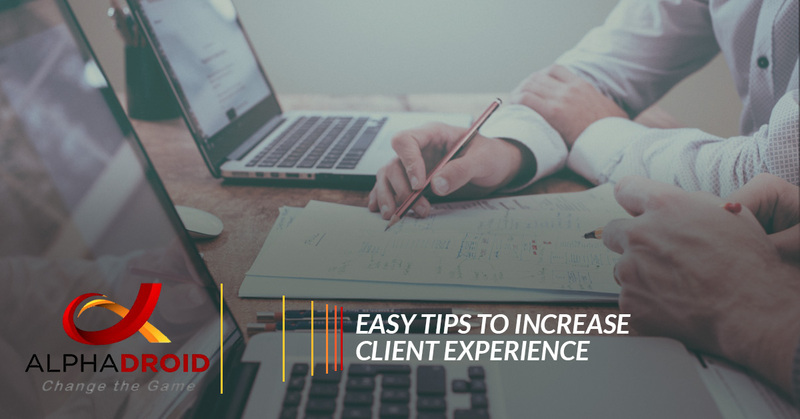 Just by making a few changes, you can increase client experience. Going above and beyond, and staying ahead of the competition will help build credibility, making you, or your firm stick out. Part of a great client experience is protecting their investments. At Alpha Droid, we understand the importance of keeping your client’s investments safe from a fluctuating market. That is why we created algorithmic trading strategies and software. Our software does the ‘hard work’ of financial planning so that you can work on developing strong relationships with your clients. To learn more about our financial management software, contact Alpha Droid today!